Keep it right and tight! BLACK FRIDAY is drawing closer and closer but some sales have already started. I have been meaning to buy all of these products from The Body Shop but held off because I was still using up a lot of my skincare products. 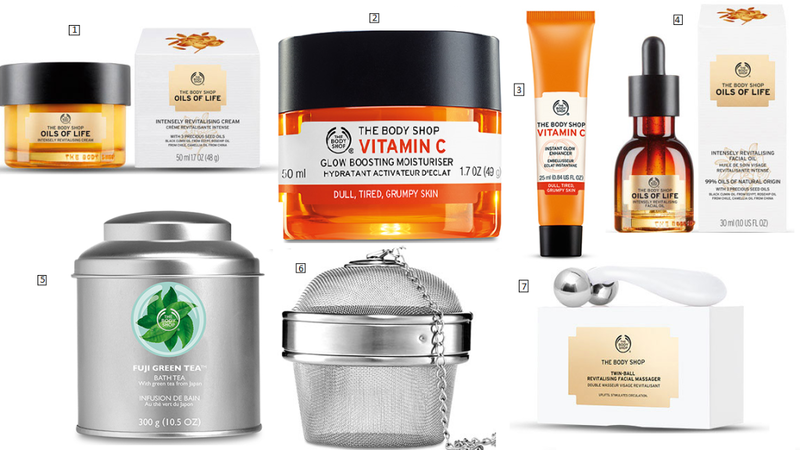 Now, The Body Shop have 40% off for black friday (make sure you enter the code; 14670 at the checkout). For me moisturing is everything. I try to moisturise my skin twice a say (after washing and toning in the morning and after cleaning and tonining in the evening) because I feel as though it gives my skin new life. I find that when I consistently moisturise, my black marks and blemishes deminish a lot quicker which is a plus as I like having clear-mark free skin, I mean, who doesn’t? I wanted to try out this cream because it’s infused with oils and usually I enjoy applying oil to my face (I do it once a week or so) but it means that I refrain from applying my moituriser because I already have oil on my face (make sense?). I feel like this cream will kill two birds with one stone and make my life easier. I suffer from Anaemia and Endometriosis as you all know. 90% off the time, I’m very tired and it shows through my face. I feel like I never get enough sleep even when I’ve had up to 9 hours and I hate that I sport the fatigued look. I want to use this glow boosting cream to give me that extra natural glow that I’m constantly loosing out on due to lack of iron in my blood. I do still plan to increase my iron levels whilst using this product so it’s not a such a long rigmarole. I’ve pretty much explained why I need all the energy boosting that the world has to offer but from the reviews of this product, I can see that a lot of people use it as a primer too! I’m looking for a good primer so I want to put this one to the test. I mentioned prior that I use a face oil once or a few more times a week. I feel as though my facial routine can be somewhat vigarous and I like to put all the natural oils that I’ve lost whilst cleaning back into my face. I usualy use a brazil nut oil which I LOVE THE SMELL OFF (it’s also very kind to my skin) which is also from the Body Shop but I can’t find the link online! Well, that oil is on it’s way out and I want to try something new. I never really take baths. I’m African so the only baths I have are bucket baths (haha) but occasionally I lay in the bath but not for too long. I’m really tall so it’s not my favourite thing to do but I want to try this product out. I never really treat the skin on my body too much so I’m hoping that this will give it a little more of a pamper session! I have no plan of cleaning up no damn tea leaves so I need this to make it a smooth operation. In my skin care video, you’ll see that I tap my face with my fingers after moiturising. I do this to wake it up a bit and bring the blood to the sufare area. If I’m honest doing it annoys me because I’m someone who is easily distracted but I like the effect it has on my skin so I’m so lucky to come across a tool that will do just that for me! If you guys do buy something from the Body shop, tweet me @Melswardrobe and show me what you got! Also, just to keep your minds at bay, this post was in no way sponsored! Great post I also find the vitamin C moisture cream very good for enhancing the face. I’ve also recently done a post on the Vitamin C range check it out!